A special PM software module included in this equipment maintenance software package offers an additional way to manage simple calendar-based preventive maintenance. An equipment maintenance software work order module is normally where preventive maintenance work is managed. 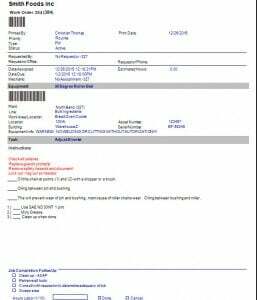 Furthermore, this equipment maintenance software provides a work order module for this purpose and a preventive maintenance module. The preventative maintenance software module is dedicated to helping the maintenance manager manage calendar-based preventive maintenance tasks. Using this dedicated PM software module (found only in MaintSmart) the maintenance manager or the technician can quickly and accurately close many PM tasks. The PM software module may either augment or replace the need to perform PMs as full work orders. Below are listed some benefits of managing preventive maintenance in the exclusive calendar-based PM software module. Issue PMs manually (with filters) or automatically by the scheduler. PMs regenerate automatically when closed. Better accountability for specific equipment and task completions. Faster closing. Close many PMs at once using average completion time and other shortcuts. Include unlimited text details with each task. Include unlimited parts list with each task. Enforce rules for technician closing their own PM completions. Reliability analysis module links to PM software module to suggest preventive maintenance task intervals by using MTBF. Use work order templates to trigger PM tasks by schedules or meters. Additionally, work order templates recycle themselves. Work order template generated preventive maintenance task lists may also contain unlimited file attachments. 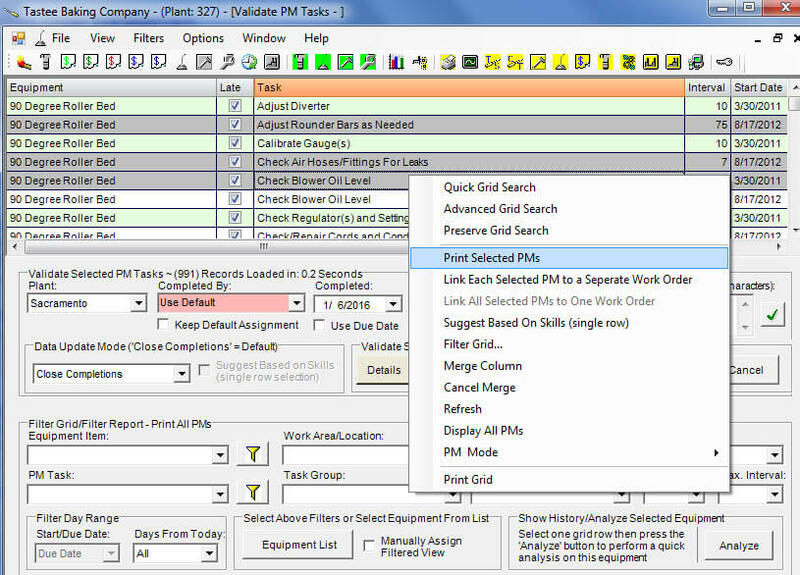 There are more fields with work order templates that may provide additional needed detail to the PM task. Link unlimited parts lists to work order templates. Include unlimited detailed instructions with each work order. Embed calendar-based PMs in a work order. Close the work order and all the linked PMs also close. This gives the maintenance manager the benefits of both work order and PM modules. Configure PM task list for the first (and only time). Issue PMs to technicians by print, email or electronically. Technician performs work and closes PM. Archive the PM task (closed) into PM history. Additionally this provides closed date, late or not, who closed the PM, labor hours and parts lists. The PM recycles (regenerates) into a new PM by setting the new Start Date = Completion Date and creating a new Due Date = Start date + Interval (in days) after closing. PM task list is now ready for next PM cycle. A work order template starts with an existing work order. Link the new work order template (optional) to a schedule or a meter. The expiring schedule or meter triggers a new work order template automatically. Specifically, the work order template is not consumed but rather creates a copy of itself in the form of a new work order. To clarify, the created work order is a new record (full work order) unlike the calendar-based PM that is an existing record with an updated Start Date and Due Date. Calendar-Based PMs or Work Order Templates? Both work order templates and the calendar-based PM software module have useful qualities. Most user end up using both of these components. To explain, use the PM module for basic day to day or other day-interval type preventive maintenance work. On the other hand, work order templates are best for more involved work or detailed job assignments. For example, use work order templates to accommodate file attachments, extensive detailed instructions and spare lists. Fortunately with this equipment maintenance software package both of these modules come complete with the basic program. To fully understand these alternative ways of managing PM task lists it is useful to schedule an online demonstration of the program . Contact us for a personalized free, no obligation demonstration. Calendar-based PM task lists come in multiple formats. Each PM task may have unlimited detailed instructions and parts lists. Create preventive maintenance task assignments one time. Thereafter, the PMs regenerate automatically when closed. This automation saves the maintenance manager time as builds consistency into the preventive maintenance program. Additionally, the PM module works best if your PM system contains calendar-based tasks or checklists. In short, choosing an equipment maintenance software solution with the capability for short list-based tasks and detailed PM tasks give the maintenance manager the flexibility needed to effectively manage all maintenance requirements. Use work order templates to generate new work orders that are identical to the template. Undoubtedly, when a more detailed format is required for preventive maintenance task lists and management of PMs it is best to use a full work order. 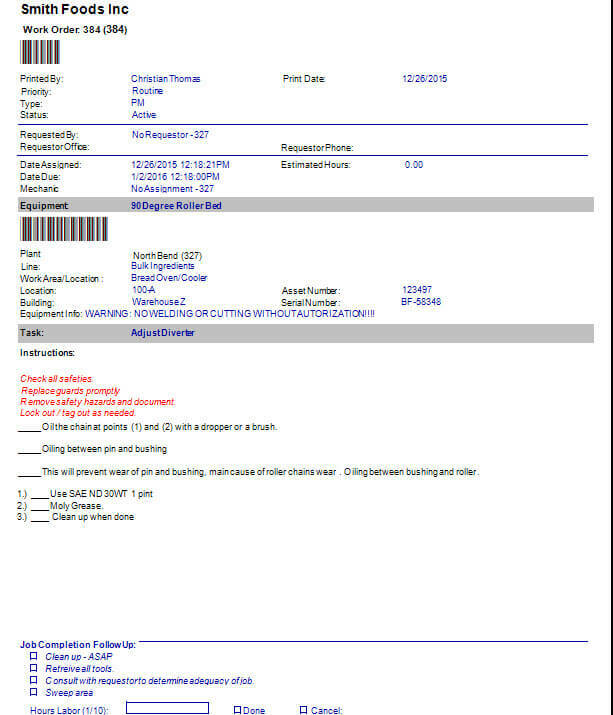 Additionally, these templates generate new preventive maintenance work orders from meters. To clarify, a meter is a user-defined unit of anything. For example, meters are cuts, cycles, miles, months, units and so on. In short, meters make it possible to tack and manage any demand-based preventive maintenance (as opposed to calendar-based). Best of all, OPC compliant data sources, such as, RSLinx, Wonderware and other link directly to the equipment maintenance software. The result is a fully automatic, demand-based preventive maintenance solution. Technician (person task is assigned to). Copy PM tasks lists from one equipment to another if both equipment items share a similar task list. In other words, in the case where multiple conveyor systems exist the PM list from one conveyor is copied to the other conveyors. The result is, great consistency in job assignments while bringing your company up to speed quickly with their PM task lists. 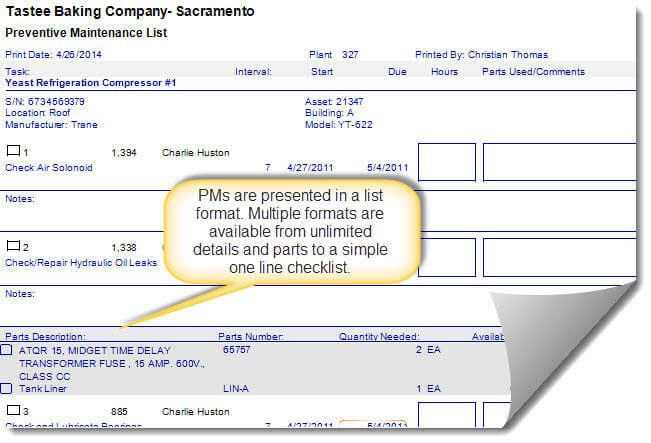 In general, it is possible to create PM tasks lists for an equipment maintenance operation with 200 equipment items in approximately 20 hours.